Aotearoa - meaning 'the Land of the Long White Cloud' in the Maori language - was the original name given to the North Island of New Zealand, and is now their name for the whole country. Symbiosis has been recording the natural sounds of this beautiful place for their latest album, and these pages carry information about those recordings, as well as extracts of the sounds to download, and photos of New Zealand. 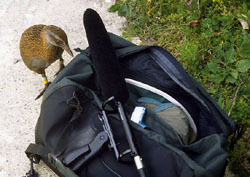 In the southern hemisphere's spring and summer of 1996, musician and sound engineer Clive Williamson visited New Zealand to record the country's beautiful nature sounds. 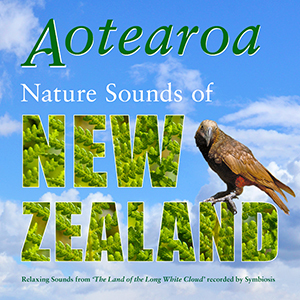 The result was 'AOTEAROA - Nature Sounds of New Zealand', an album on cassette and CD which captures the essence of many of NZ's amazing natural environments. From forests and bush to Pacific shores, via waterfalls, caves, streams and geo-thermal activity, this 52 minute album features relaxing and energising 'postcards in sound' from all over the country. Clive Williamson's recording odyssey took him from the Bay of Islands in the north to Dunedin and the Otago Peninsula in the south to hear New Zealand's wonderful natural atmospheres, and the calls of entrancing birds like the Tui, Bellbird and Saddleback. Each track on AOTEAROA is presented as a journey in sound through a different region of New Zealand. The bird-rich off-shore island sanctuaries of Tiritiri Matangi and Kapiti are both featured, as is Rotorua, and the Pacific coastline of the South Island with its colonies of Little Blue and Yellow Eyed penguins. Another 'journey' was recorded in Waitomo and King Country in the centre of North Island, where Clive was caught in a thunderstorm in Mapara Wildlife Reserve. The spectacular rolling thunder is one of the highlights of the album, as is the atmospheric sound of water dripping in Waitomo's famous glowworm caves afterwards. The New Zealand Tourism Board's London office were so impressed by AOTEAROA that they sponsored its release in the UK. They saw the album as a way of successfully promoting New Zealand as a unique holiday destination that 'refreshes, replenishes and inspires.' The original recordings were co-funded by Clive's group Symbiosis and the BBC, who now make them available for use in their radio and television programmes. Clive has since re-visited NZ to make more recordings and to promote the launch of a special New Zealand edition of the album, which is now manufactured and distributed throughout the country via Auckland-based Ode Records. Waitomo & King Country takes the listener on a journey from daybreak in Waitomo Gulley down into the famous glow-worm caves themselves, via gentle waterfalls and rolling thunder in the nature reserve at Mapara. The longest track, Dawn to Dusk Relaxation is a peaceful 'postcard in sound' from the North Island, with tranquil dawn chorus bird-song, gently lapping waves, streams, cicadas, fantails playing in the bush and, as night falls, a lone morepork owl calling in the distance. Pacific Shores eavesdrops on the protected birds of the Little Blue and Yellow Eyed Penguin colonies by the ocean on South Island and, finally, The Power of Mother Earth reveals the surprisingly soothing sounds of hot streams, steam vents and bubbling mud. Bellbird Dawn, South Island  captures nature's harmonious chorus of Bellbirds in the forest near St Arnaud and Lake Rotoiti. Lazy Summer Days, NZ  a series a tranquil atmospheres from both North and South Islands (Waimangu; the Piriri River Walk, Punakaiki; Dannevirke; Lower Hutt and Maropiu). Nga Manu (The Birds)  purely birdsong, featuring ten endemic species including Kea, Kaka, Bellbirds, Tui, Kakariki, Saddlebacks, Stitchbird (Hihi) and Kiwi. Aotearoa  A Natural Reprise  highlights many of the signature sounds from the album in one track. Finally, Sweet Sounds on the Sea Breeze (Bellbird & Tui Mix) introduces the musical side of Symbiosis' work, with Clive Williamson playing gentle, relaxing Autoharp to an atmospheric accompaniment from the Pacific ocean and NZ's unique birds. ...or ask any NZ record store to order a copy for you! Symbiosis, 14 Ash Hill Road, Torquay, Devon, TQ1 3HZ, England. CREDITS: Cover Photo of original 'AOTEAROA' album by leading New Zealand wildlife and landscape photographer CRAIG POTTON. Thankyou to all those New Zealanders who helped make these recordings possible through their advice and assistance. Special thanks to: Emily Jane Sinclair (for her invaluable help in making the album and for the thousands of kilometres of patient driving needed to gather the sounds!) and to Roger Marbeck for his continued support for this project in NZ. Features sounds from: Wai-o-Tapu and Waimangu Thermal Reserves (Rotorua), Waitomo Glow-worm Caves, Hauraki Gulf, Kaikoura, birdsong and bird calls, tui, bellbird (korimako, makomako), saddleback (tieke), kaka, kea, fantail (piwakawaka), morepork (ruru), whitehead (popokatea), new zealand robin (toutouwai), stitchbird (hihi), red-crowned parakeet (kakariki), grey warbler (riroriro), yellow-eyed penguin (hoiho), blue penguin (korora), weka, cicadas (kihikihi), chaffinch, song-thrush, sparrow, Tiritiri Matangi and Kapiti islands, gentle rainfall, distant thunder, surf, Mapara Reserve, Oamaru, Otago Peninsula, Shakespear Regional Park, Nga Manu Sanctuary, Whangaparaoa Bay, dawn chorus, temperate rain forest, and the Pacific ocean. Deluxe Edition adds the sounds of: kiwi, South Island bellbirds, silvereyes, blackbird, weta, Lake Rotoiti (Bellbird Walk), and the Pororari River near Punakaiki, S.I.